We’d love your help. Let us know what’s wrong with this preview of Spacesuit by Nicholas de Monchaux. How the twenty-one-layer Apollo spacesuit, made by Playtex, was a triumph of intimacy over engineering. To ask other readers questions about Spacesuit, please sign up. Parts of this book were super interesting--I loved the beginning, how de Monchaux connects the early balloon flights and learning that the human body does not do well in the upper atmosphere, and the "New Look" of Dior and changes in the fashion world to why and how the space suit was eventually constructed. The parts about Mission Control and NORAD were kind of interesting as well. However, towards the end, he goes on this city planning tangent that barely feels connected to the space suit at a Parts of this book were super interesting--I loved the beginning, how de Monchaux connects the early balloon flights and learning that the human body does not do well in the upper atmosphere, and the "New Look" of Dior and changes in the fashion world to why and how the space suit was eventually constructed. The parts about Mission Control and NORAD were kind of interesting as well. However, towards the end, he goes on this city planning tangent that barely feels connected to the space suit at all and is...well, kind of boring. In addition, I was listening to the audio version with Bronson Pinchot narrating and his pronunciations really bugged me. And I'm not sure if there are pictures in the book version (I'm assuming there are), but it would have been really helpful to see some, especially when de Monchaux is describing the differences in various versions of the space suit. Oh, the perils of audiobooks! I went in with high expectations, and I was still blown away. Although the beginning is a little slow and seemingly disjointed, Nicholas De Moncahux is really laying the groundwork for a symbiotic set of vignettes (layers) on the spacesuit. This book is the perfect confluence of theory, structure and practice - each meditation on Rauschenberg or Chanel feels like it adds to the overall story of Playtex and the construction (fashioning) of the Apollo suits, rather than being extraneous. It's real I went in with high expectations, and I was still blown away. 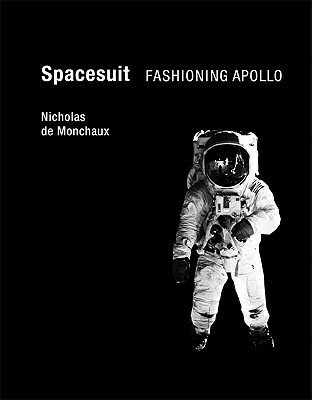 A fun book for nerds and geeks, Spacesuit:Fashioning Apollo provides an overview of the history and science of the spacesuit. Clever in organization and broad in scope, this book was a blast to read. This book explores the history behind the space suit used for the Apollo missions and how an unconventional (for space exploration) company that manufactured girdles and bras went toe-to-toe with the top engineering and technology firms of the era for the contract to make the Apollo spacesuit - and won. Early spacesuits were clunky and hard to move in, not very maneuverable. For extended missions of 10 hours or even a few days (such as the Moon missions), the suits were very uncomfortable to be in. Sweat with nowhere to evaporate would collect in the suit and upon subsequent extraction the astronaut would look like he'd been submerged underwater for an extended period. Diaphanous hands were a significant mission risk. The A7L that Playtex designed had 21 layers, with a significant focus on comfort of the wearer and of of redundancy. It was very adaptable and was built to be light, tactile, and maneuverable, unlike many of the competitor's futuristic looking metal spacesuits - and was a triumph of usability design over looks, of practicality over glamour. The book starts with the early history of space travel, starting with the first balloon flights, and how people first dealt with high altitude flights which require pressurized suits to prevent death. The book then explores the history of spacesuits including the A7L Apollo suit, and several of the subsequent hard suits that were an improvement but were ultimately never used. The book also sheds some light on the political and social climate of the era of the moon missions - exploring how the cold war shaped the space program - most space rockets were simply repurposed ICBMs with the nuclear warhead replaced with a space capsule, after all. Add poIt also explores how the very practical and results-oriented culture of Playtex - staffed with rank upon rank of seamstresses, and designers - integrated with the heavy bureaucratic and engineering-oriented culture at NASA. The book loosely touches upon several aspects of systems engineering, of fashion, design, redundancy, and the cold war and the military-industrial complex. I was a little disappointed by this book. I was expecting it to be about the technical design of the suits, a literal examination of the 21 layers that it talks so much about. Instead, it tries to make a (somewhat painfully forced) point about space adapting to humans rather than humans adapting to space via a series of essays, many of which are only tangentially related to the space program. It reads more like a humanities textbook than the technical account that I was expecting. This is an excellent book. Not does it give the reader a great look into the space suits used for apollo missions, it also talks of U.S. politics, and the influence of advertising and the fashion industry. It's broad and interdisciplinary, but very much recommended. A special book with a special perspective. An architect (and professor of architecture) looks at the fascinating story of how the people who made Playtex bras and girdles ended up beating out military-industrial giants to fabricate the clothing that humans wore in space and on the moon. 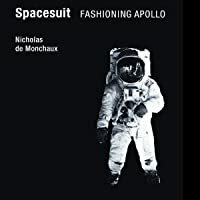 Taking the suits' multi-layered structure as his reference point de Monchaux explores, in 21 short, extremely readable chapters, the encounter between the fragile and unique individual human (astronaut) body and A special book with a special perspective. An architect (and professor of architecture) looks at the fascinating story of how the people who made Playtex bras and girdles ended up beating out military-industrial giants to fabricate the clothing that humans wore in space and on the moon. Taking the suits' multi-layered structure as his reference point de Monchaux explores, in 21 short, extremely readable chapters, the encounter between the fragile and unique individual human (astronaut) body and the mammoth systems engineering behemoth that was being created to fulfill Kennedy's order to put a man on the moon in less than a decade. De Monchaux weaves his story out of both astute and often entertaining appraisals of the various design strategies used and the very human stories behind the master seamstresses, test pilots, businessmen, and bureaucrats that managed to find a way to work together in the service of a truly monumental goal. Along the way he exposes many fascinating offshoots and extensions of the project, including the attempt to take a systems approach to urban redevelopment as the space program wound down in the face of the need to tackle pressing terrestrial problems. A record of the victory by redundancy and adaptation over systems engineering to produce the A7L spacesuit, De Monchaux's book adopts the structure of said spacesuit, resulting in 21 overlapping but essential chapters; each deals with a different aspect of the A7L story, from its competition with "harder" alternatives to its production by Playtex. Notable among these are a chapter on JFK's image consciousness, and an extensive history of early flight suits from Wiley Post to the U2. This is an am A record of the victory by redundancy and adaptation over systems engineering to produce the A7L spacesuit, De Monchaux's book adopts the structure of said spacesuit, resulting in 21 overlapping but essential chapters; each deals with a different aspect of the A7L story, from its competition with "harder" alternatives to its production by Playtex. Notable among these are a chapter on JFK's image consciousness, and an extensive history of early flight suits from Wiley Post to the U2. I enjoyed the space/NASA history, the connections to fashion, victorian ballooning (and mechanical ducks), the lovely photos and gorgeous texture (I do like good paper and softcovers). I quite enjoyed the discussion of the development of systems engineering & the ongoing successes & failures. Unfortunately, that part is a little close to home. It was interesting to focus on the soft spacesuits and the various systems implications. I'm not sure I'm a huge fan of his drawn out conclusion, I enjoyed the space/NASA history, the connections to fashion, victorian ballooning (and mechanical ducks), the lovely photos and gorgeous texture (I do like good paper and softcovers). I quite enjoyed the discussion of the development of systems engineering & the ongoing successes & failures. Unfortunately, that part is a little close to home. This cultural history of the development of the Apollo space suits is a fantastic book. It's written as a collection of essays, ranging from the early history of ballooning and high-altitude travel, to early 20th century daredevil pilot Wiley Post, to Christian Dior's "New Look," all the way through the birth of cybernetics, the roles of women in the US space program, and late 20th century urban planning. I can't recommend it highly enough. Easily ranks up with (and would definitely appeal to re This cultural history of the development of the Apollo space suits is a fantastic book. It's written as a collection of essays, ranging from the early history of ballooning and high-altitude travel, to early 20th century daredevil pilot Wiley Post, to Christian Dior's "New Look," all the way through the birth of cybernetics, the roles of women in the US space program, and late 20th century urban planning. From page 20: "Against this background, Hawthorne Gray set out in November 1927 for the last of three high-altitude flights. His craft would soar above 44,000 feet, but an accurate estimate of his breathing supply's longevity would leave Gray dead long before the balloon's landing at 5:20 p.m. 'Undoubtedly,' a posthumous award of the Distinguished Flying Cross concluded, 'his courage was greater than his supply of oxygen.'" Strange book. The author makes many tangential detours, some are interesting and some are not. The parts about the suit, it's history, development and construction are very good and the sections on systems engineering as it relates to urban planning (still don't see the connection to the main subject) were not, at least to me. An excellent, wide-ranging look at the technology, institutions, and cultural expectations surrounding the Apollo Project's A7L spacesuit. Written from a cultural studies perspective, which expands its scope to include not just spacesuits, NASA, the International Latex Company, and systems design, but also Dior's New Look and the public imagination about space flight. "In its visual vocabulary of checks and crosses, the black-and-white cathode of the GE [simulated lunar approach and landing] system is remarkable for its reduction of the lunar goal to its essence--a mastery not so much of earthly space or outer space, but of information space" (de Monchaux, pg. 175). Living in Houston, I pick up a lot about NASA almost by osmosis. I found this book to have a really cool angle for examining the space program. I liked the layer format used in the book to look at a single object in so many different ways, and I found the writing to be clear and easy to follow. A really enjoyable scientific history book. Did you know that the suits worn during the moon landing were made by the Playtex corporation, hand-sewn by seamstresses who usually worked on brassieres and girdles? This story is a fascinating combination of science and craft that reaches repeatedly for grand themes and cultural history. No book is right for everyone, but this is one that has something to offer for a wide variety of readers. There is an abbreviated history of the various American space suits up through the Apollo program in here, but it's well-hidden beneath mountains and mountains of irrelevancies and aggressively pretentious, high school-level prose. A fantastic overview of the history of flight suits, systems engineering, fashion, design, robustness, and the military-industrial complex, all circling around the story of the Apollo space suits. I learned a lot and it left me with a lot to think about. An interesting look at the design and fabrication of the A7L and it's competitors to take man to space. This book is as complex and layered as the A7L itself and goes in a number of tangents, some having little to nothing to do with the subject. Beautiful book with a multi-disciplinary and elegantly constructed view of the space program, the era, human endeavor, and fashion. Just amazing. A unique history of space travel, latex, system thinking, women's fashion, the military industrial complex, and other tales related to the micro-architecture of spacesuits, arranged in 21 'layers'. Holy Smokes! I had no idea! This is an interesting read that I'm happy to have come across. Thanks NPR. This book was really hard to read. It was about soooo much more than the spacesuit, and it read like someone's PhD dissertation... very dry and somewhat meandering. Could not recommend. A terrific, stunning read. An absolute must for those interested in space and American history. Enjoyed the over view of the engineering "processes" and how it compared to the more artistic approach taken for the suit. Highly recommended - a very different view of the various challenges (political, social, technological, physical) involved in sending humans into space.